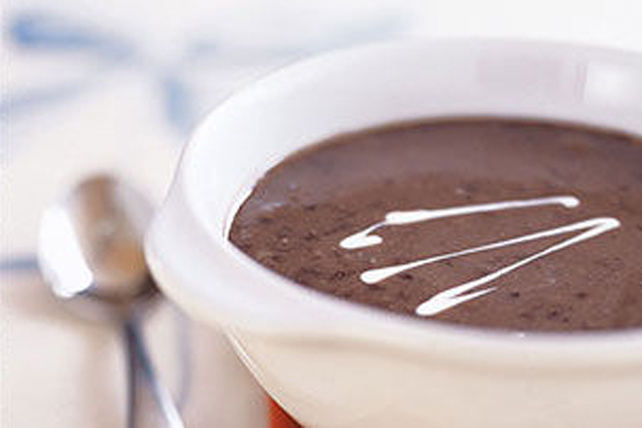 This hearty black bean soup is easy to prepare and is ready to serve after a 15 minute simmer. Cook and stir onion, garlic and cumin in oil on medium-high heat in large saucepan 3 min. or until onion is tender; remove from heat. Place 1 can of the undrained beans and the broth in blender or food processor container; cover. Blend until puréed. Add to ingredients in saucepan. Repeat with second can of undrained beans and water. Add remaining can of beans and tomatoes; mix well. Bring to a boil on medium-high heat. Reduce heat to low; simmer 15 min., stirring occasionally. Ladle the soup into each bowl; top with cheese. Top this delicious soup with low fat sour cream or Kraft Tex Mex Shredded Cheese for added flavour and serve with your favourite Christie's whole grain crackers. This delicious bean-based soup is very high in dietary fibre!